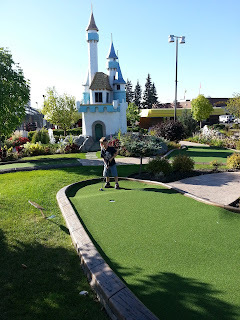 After school yesterday, my 4-year-old son and I met up with another family for a round of mini golf at Putt n' Bounce. What a perfect afternoon! This 18-hole outdoor course is located in the Fuddruckers Fun Centre, off 8th Street & Arlington, in Saskatoon. I had never been to this mini-golf course before and was quite impressed with the lovely landscaping. Everything looked very well maintained; in fact, they were in the process of replacing some of the carpeted "greens" while we were there. Our boys were also excited to try out The Rock for the first time. 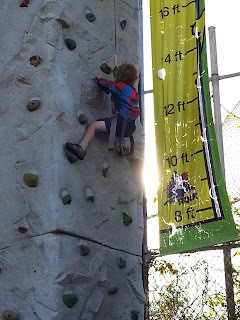 The Rock is a four-person outdoor climbing wall just beside the mini golf course. The auto-belay safety system allows for safe, fun and independent climbing for kids over 40 pounds. Also nearby are the Grand Slam Batting Cages, Ruckers and Fuddruckers. There are covered picnic tables as well as indoor event rooms for birthday parties. The outdoor features are closed once the snow flies and open again when it all melts in the spring. They will take reservations, so call when in doubt, 306-477-0808. More pictures from our day at the Fuddruckers Fun Centre are available on our Flickr Photostream.